Fishing can be an enjoyable pastime, but it is important to fish responsibly so as not to tax the under-water ecosystem. To review the current regulations for fishing in our area, click here. 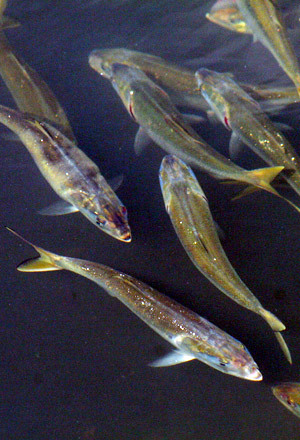 Depleted stocks of marine life can cause a disruption in the ecosystem. For example, depleting jellyfish predators is causing a global jellyfish population explosion. Observe catch restrictions including size and quantity imposed by local authorities. These limitations are determined by using science-based management and taking into consideration the economic value of fishing. By observing catch restrictions we can help ensure a continued supply of marine life for future generations. Unlike freshwater fishing, no license is required, but many people don't know that recreational saltwater fishing in NYS requires registering with the DEC. Click on the link above for registration information. The link includes fishing limits (size and catch numbers and season) for a variety of species. The common species would include: bluefish, striped bass, weakfish, summer flounder, tautog (blackfish), Scup (porgy). The link also provides limits for blue claw crabs and clams and lobsters. No registry is required for blue claw crabs. One easy-to-implement suggestion is to eat eco-friendly seafood! Using the traffic light color convention, the Monterey Bay Aquarium is helping people make informed decisions about seafood purchases. Check out this link: seafoodwatch.org. Click on Seafood Recommendations, and go to Consumer Guides. It can be downloaded, printed, and kept in your wallet for easy reference!